There’s a 22-inch brown trout that lives in the same run in my favorite river. His pectoral fin, on the right side, is split in half. His gill plates are more blue than normal (almost indigo in low light). And his lower jaw is just starting to curl. I know all this, of course, because I’ve caught this fish three times in the past two years. I haven’t given him a name. Last weekend, I went to the river and just watched him work. He’s pretty predictable. The run he lives in isn’t that large, maybe the size of a pool table, but it’s deep, and two nymph-blocker rocks there create a perfect zig-zag current that forces bugs into a hard seam. That’s where he likes to set up camp on when the blue-winged olives hatch. If the wind isn’t blowing too hard, I can actually hear him chopping away, his mouth opening and snapping shut like a tiny music box. I didn’t feel like casting at him. It’s been a long, hard summer for both of us. He’s been on the constant treadmill of atypically high water (when there’s a drought, the powers that be push even more water through this river toward the ranches and farms on the Eastern Plains). I’ve taken a new job, and have been on the road. 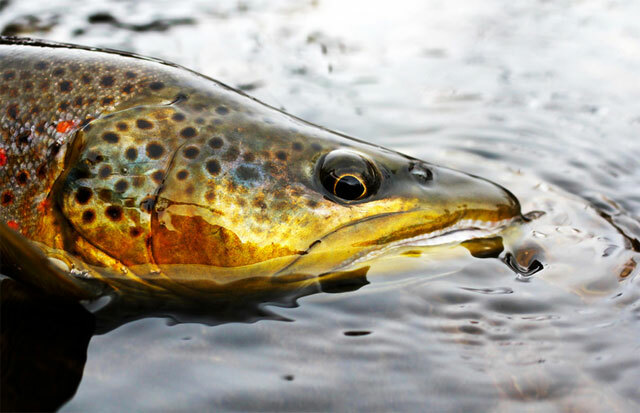 Most trout anglers think of brown trout like this as their “quarry,” and they might even grow to respect them as “worthy adversaries.” I think of this particular fish differently, almost like a band mate, or a dance partner. I play better music—my moves are sharper—with him than with most other fish. Maybe “sparring partners” is a better analogy, because we’ve definitely traded blows over these months, even spilled each other’s blood (I sunk a hopper hook deep into the corner of his mouth; he sliced my finger with the fly line). But ultimately, I think we’re on the same team, and we make each other smarter… better. And so, it seemed appropriate to just sit and watch the other day. I’m not sure he noticed me when I came to say goodbye. He didn’t seem bothered, since he just kept mowing through the rafts of bugs until the air got cool, and they simply went away. So I did too. But not without the hope that the winter would be kind to both of us. And that not too long after the thaw, he and I might meet up again in this same place. To answer the bell, and go a few more rounds.